The much-anticipated cabaret 54 Below has finally opened! And they’ve opened with a real bang, a new cabaret act from Broadway legend Patti LuPone, that (figuratively) blows the roof off this basement boîte. Entitled “Far Away Places” after a song popularized by Bing Crosby (which Patti gives a tender reading), the act looks towards places distant in both time and space, from Old Bilbao to 1970s New York City. The various songs add up to a search for a place packed with excitement and danger, with references both explicit and subtle to the excitement and danger that happened upstairs at Studio 54 in the late 70s. And not just upstairs; the club itself occupies the space that used to be the ramshackle “VIP” room where Halston and Bianca Jagger (allegedly) snorted cocaine. Director Scott Wittman (also 54 Below’s “fairy godfather” creative consultant) makes sure that that thrilling tension permeates the act from beginning to end. Not that LuPone needs that much help to be thrilling. This is one of those cabaret acts that climaxes every ten minutes or so, and Patti hits all of those climaxes out of the ballpark. Cole Porter’s kooky “Come to the Supermarket in Old Peking”, Johnny Mercer’s venomous “I Wanna Be Around”, Kurt Weill’s bloodthirsty “Pirate Jenny” – these songs sung by the belt-astic LuPone are an incredibly good thing. She’s giving it everything she’s got, and that’s a helluva lot. She’s also marvelous in the act’s quiet moments, from the abovementioned “Far Away Places” to lovely songs from her most recent star turns in Sweeny Todd and Women on the Verge of a Nervous Breakdown. 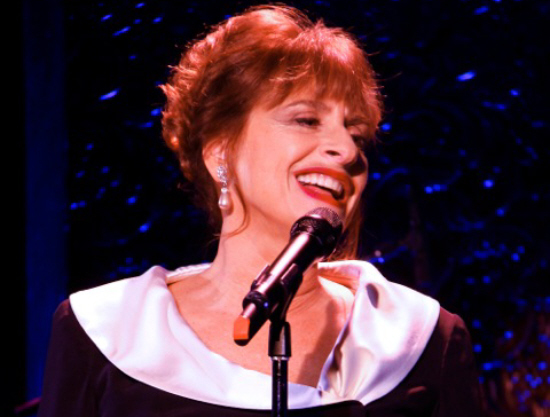 A singer-actress as potent as Patti LuPone performing this kind of high-octane act is undeniably the stuff of cabaret legend. I wish “broken legs” to all of the performers who are to follow her at 54 Below, because she has set the bar very high indeed. This is my first time seeing Once on This Island, the musical that first brought the musical theatre team of composer Stephen Flaherty and lyricist Lynn Ahrens to wide acclaim. It did not soar to the top of my list of Flaherty & Ahrens shows – Seussical and Ragtime are still firmly ensconced up there – but I do now understand the appeal of its vigorous Caribbean-flavored score. It’s the show as a whole I have some problems with. 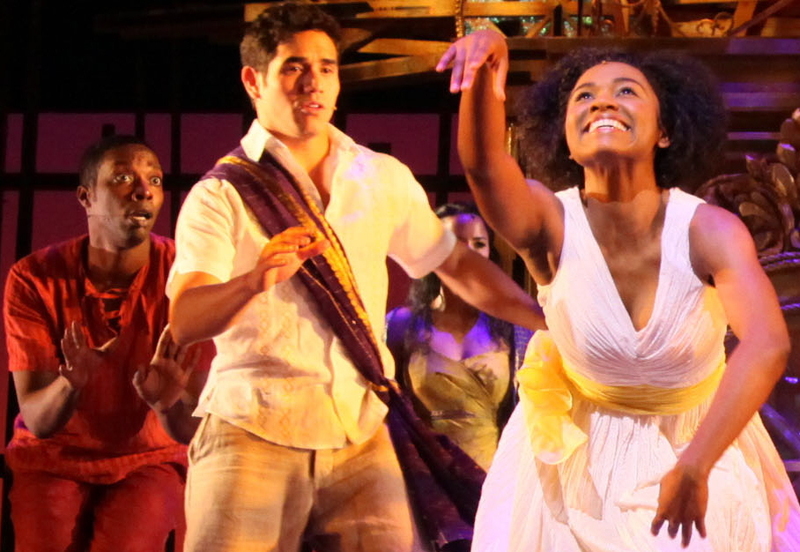 Once on This Island tells of Ti Moune (American Idol contestant Syesha Mercado), a peasant girl who rescues and falls in love with Daniel (the smoothly pretty Adam Jacobs), a wealthy boy from the other side of a fictional island in the Antilles. The island gods test the strength of her love against the powerful forces of prejudice, hatred and death. My problem rests in the underlying feeling that the “exoticism” of the Caribbean is being exploited rather than explored. Flaherty & Ahrens bring up the issues of economic inequality on the island, but never really critique them (as they later did with racism in Ragtime and homophobia in A Man of No Importance). Daniel is essentially a rich boy who gets away with everything with no consequences – and that’s not okay. That said, the Paper Mill production successfully emphasizes the musical’s considerable strengths. Director Thomas Kail has a real gift for pacing, and this Island clicks right along, with inventive, pared-down staging. Kenny Posner is one of my favorite lighting designers, and his work here captures the magic of this pseudo-mythical story. And Bradley Rapier’s athletic choreography is the engine that really drives this dance-heavy show. In the final analysis, there is plenty here to entertain both adults and children. I’m just not sure I want the kiddies leaving with the essentially conservative message of Once on This Island.